Follow the story with the pics below. "Punkin" was a neighborhood Craigslist find - literally a 7 minute walk from home - in the garage of a neighbor with a whopping 256 miles on its odometer. A few paint chips, a poorly-repaired headlamp bezel with broken lower tabs, and a non-functioning clock concluded its defects. A sale price of roughly half of retail and I rode it home. I quickly discovered that for my intentions, it was woefully underpowered. With some reading here - thanks dawgs! - a little help from the Scooters West videos, and a couple of calls to the Performance Peddlers, the go-slightly-faster parts began arriving. 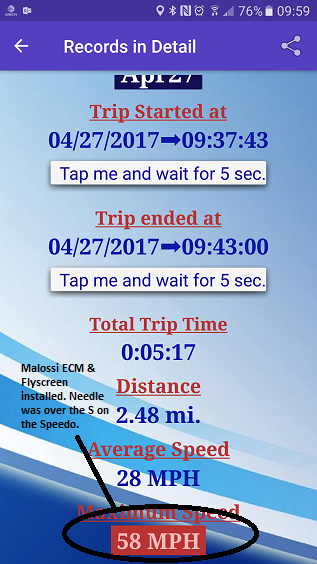 A simple Malossi variator swap with white contra spring brought the speed up a whopping 6.4 mph. I wouldn't have believed it without seeing it for myself. Next up is the Malossi Slightly-Bigger Bore kit, a considerable 56% displacement increase should help the cause, along with the fatter camshaft. Engine photos taken before dismantling facilitate routing the numerous hoses, lines and wires on reassembly. 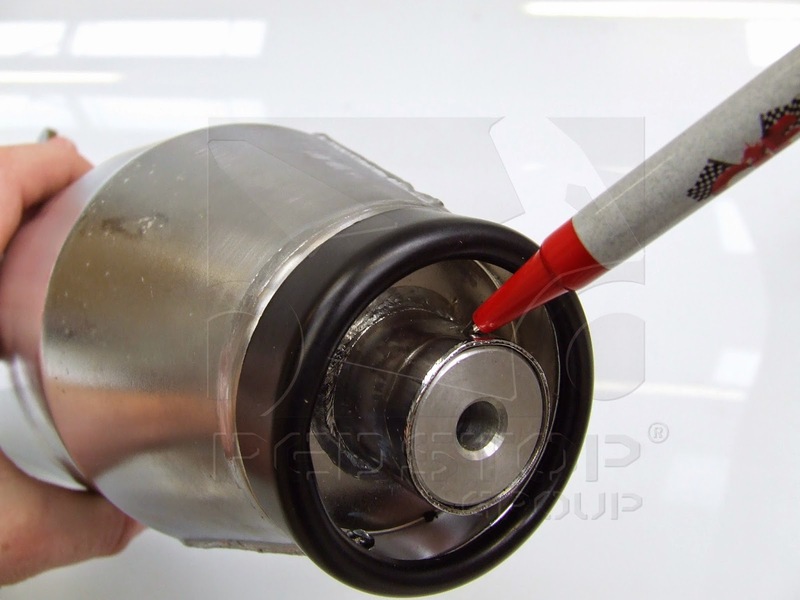 It's particularly helpful with the valve shim puck sizes for later if a clack develops. Cellphones! Who knew Mr. Bell's invention wouldn't always involve a wooden box screwed to the wall. With a hand crank. I'm used to dropping my Honda Elite 50 block - done it dozens of times, and can drop it in about 40 minutes, but first time and all plus the numerous plumbing fittings added up to a 3-hour dismount. Once off, the engine fell apart easily. New piston installed without one of the C-Clips rolling under the water-heater for a change. Cylinder glided back on and torqued to 14NM per Signore Malossi's prescription. Old cam retainer screw - a Phillips head of all things! - came off without a trace of mangling despite copious LocTite. 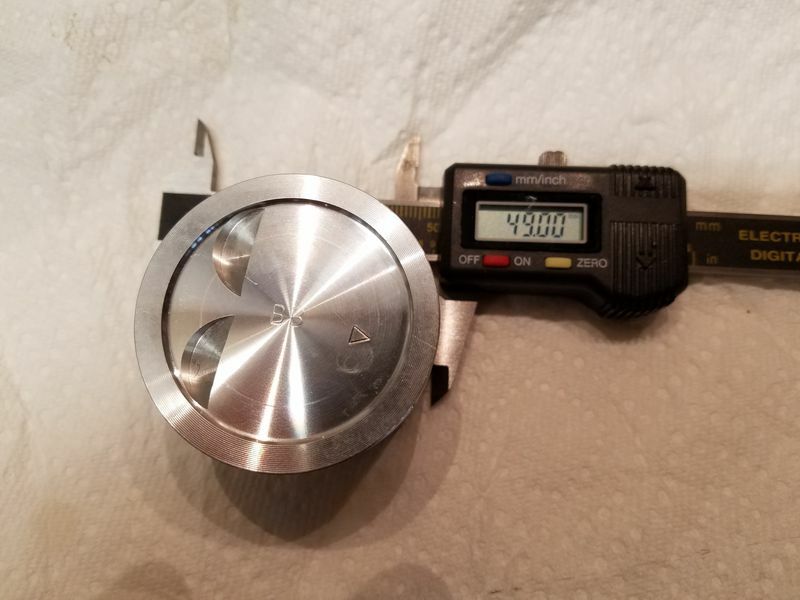 This was accomplished with a wrench applied to a fresh bit on a screwdriver and LOADS of axial pressure with jerky quick flicks in rotation. Thankfully the cam bearing was nice and snug but no puller required to remove it from its perch. Amazingly, the valve clearance, while not perfect, was within acceptable limits with the new cam installed. Startup thankfully resulted in no sickening clank-stall. It is possible to muck up the cam chain timing enough to result in piston-valve contact, but so far so good. Yes, it now has enough power to get briskly out of its own way. Next up will be a transmission upgear, to be combined with a belt, air filter and exhaust upgrade - all thankfully doable with the engine in situ. With the engine now upgraded, the stock legs (15:1 stock gearing) are short. 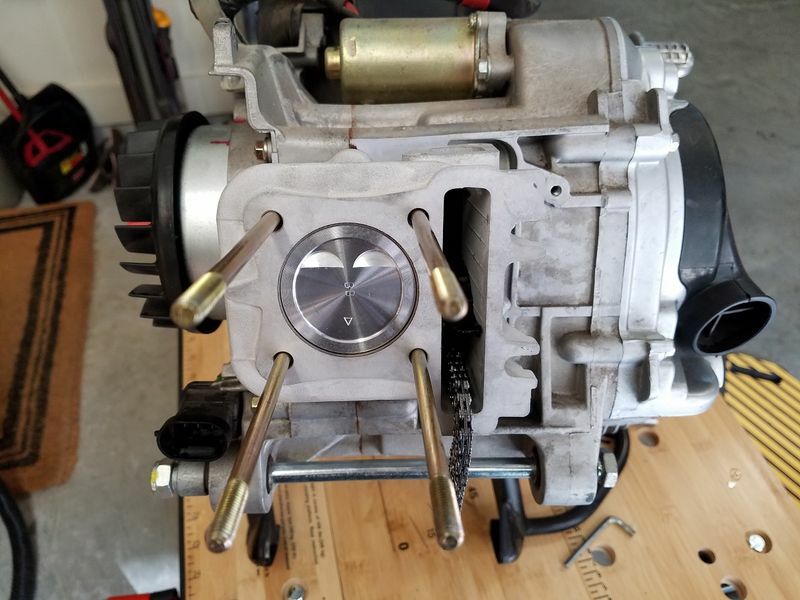 I thought I was in Scooter Transmission Hell. As I tightened the cover down the first time I was checking for binding by twisting the clutch shaft. Boy was there binding! 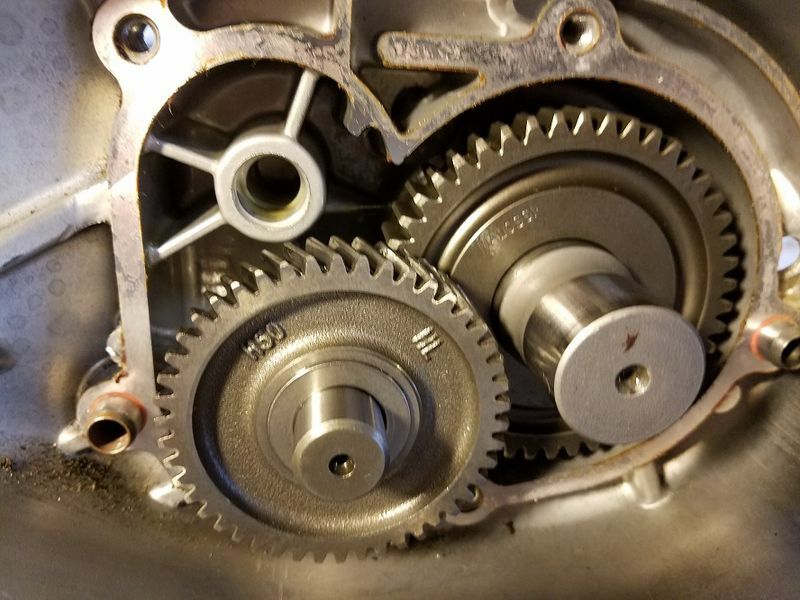 I couldn't see why; some aftermarket Honda gears require the elimination of a thick plastic washer because the countershaft supplied is too long, but the Malossi countershaft was .2mm shorter than stock, and everything was pressed on correctly. It turns out the whole assembly goes "sticky" until the cover is fully seated. It has to do with all the plain bearings in the gearcase cover. Until it seats, there'll be some angle aberance which causes the shaft ends to bind. Once torqued, with the liberal bead of Permatex Ultra Blue goo, it turned like Buttah. I'm excited to see how this turns out. Nice post! 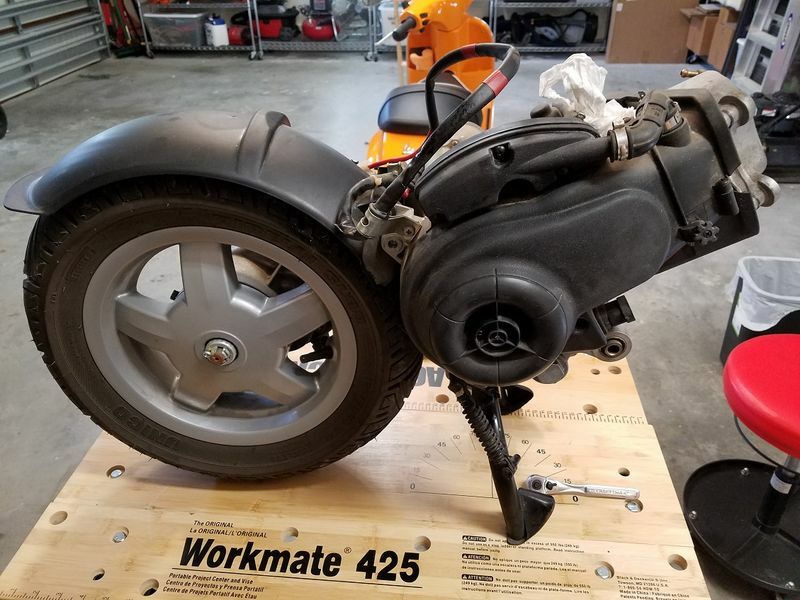 Well with the taller Malossi gears pressed into place, a grippy Kevlar Malossi belt, a 33-gram load in the variator, and (Slightly) lower restriction air filter mounted, the S50 begins to live up to its potential. 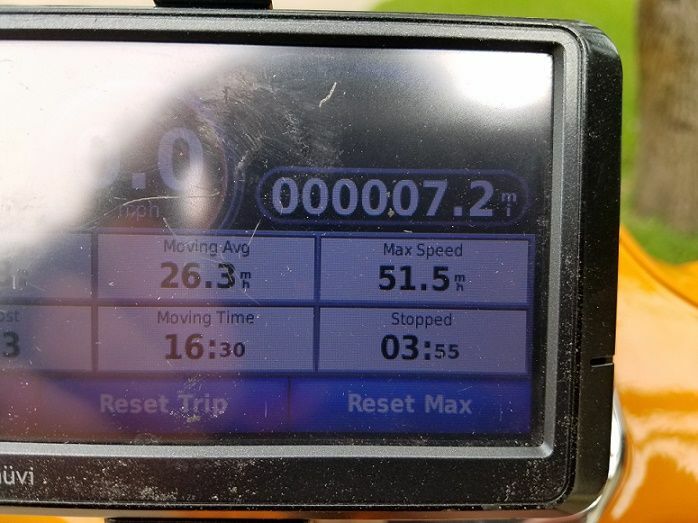 Understand that with only 25 miles counted, I'm not yet ready to hold WOT for more than short bursts, but on one such burst Garmin-girl recorded a more respectable 51.5. I pulled the spark plug tonight - quite a trick with the space available...- and found a nice tan color on the insulator, indicating the 82 Main I installed is approximately correct. Has anyone a suggestion for installation of a CHT gauge and tachometer on this thing? 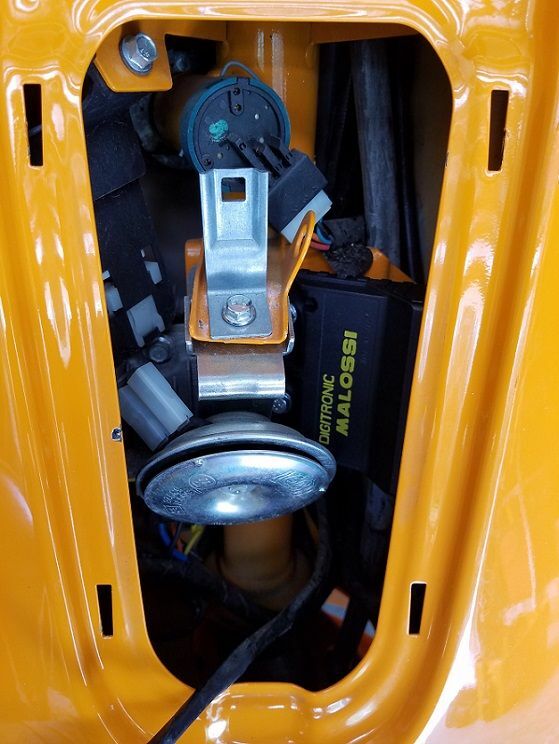 I would HATE to have a spark plug-mounted sender, given that you need a trained spider monkey to retrieve the plug and/or tools used to unscrew it in the tight space inside the right frame as it is. Finally, there was one snag on engine dismount. 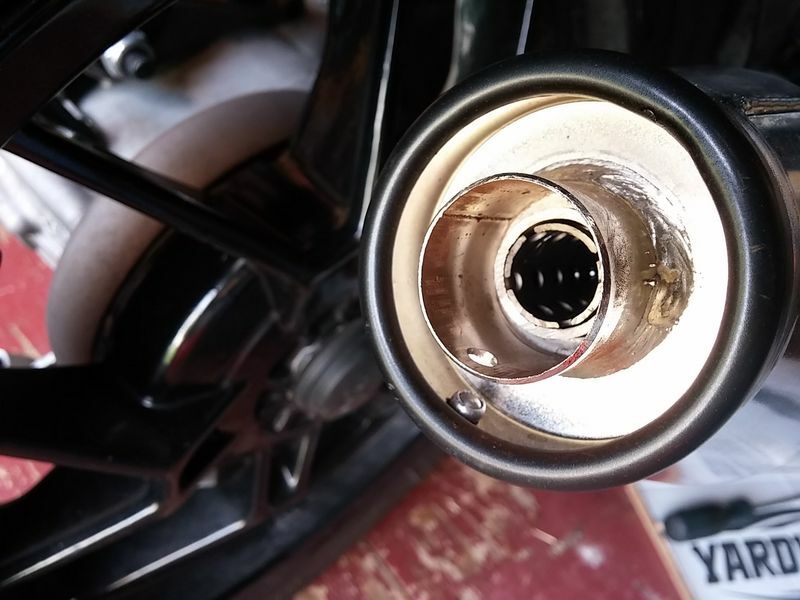 As I withdrew the long engine mount bolt, the silver cylindrical spacer thing in the pic came rolling toward me from the right side of the scooter. It's not an engine bushing, nor is there a gap between the engine bosses and the engine mount bracket. Did I reassemble correctly? Not sure I follow. 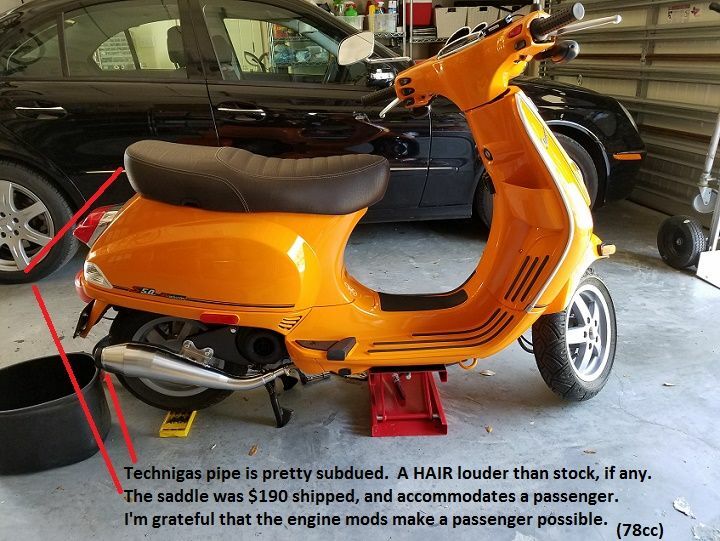 If the same frame is used for both models, why did Vespa not just shorten the mounting bolt? 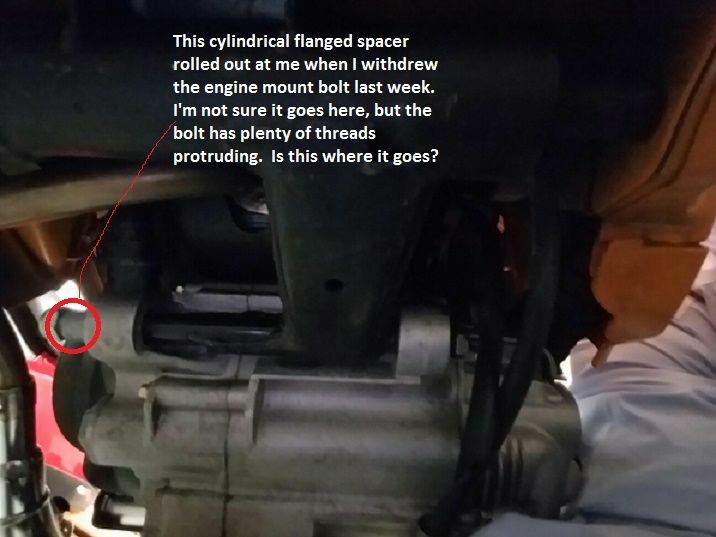 If anyone can photograph their engine mount and spot the dowel I circled I'd appreciate it. Not sure it's a problem, but what if it is? Well the engine didn't fall out of its cradle, and the newfound Oomph is welcome. Even with the taller gears, it accelerates considerably harder than stock with the new filter, pipe and of course the variator set to hold higher RPM for longer. In stock form, I had second thoughts about crossing 4 lanes of traffic, even in a 45MPH zone. Now it err... Scoots across. Top speed on a short pull tops 50 now, but I don't want to go WOT for long until a tank of fuel is spent. A Therapeutic afternoon spent in the garage replacing an apparently fried clock and installing the Tach. The former from a Dutch vendor for 35 Euros, the latter from fEeBaY for $24. In the process I taught myself to remove the legshield and footrest and got to admire the elegant simplicity of the design beneath. That dome-shaped front end ain't just for looks. It explains the vault-like solidity (compared to tube-framed Hondas...) of the front section. I found that spring!! It was in the engine compartment, resting on the belly pan. I had no idea where it goes, but will now switch things around and follow your instructions. If you or anyone has a pic of the correct assembly I'd be grateful. I also wonder what its purpose might be? HVost's advice was spot-on, thanks again! 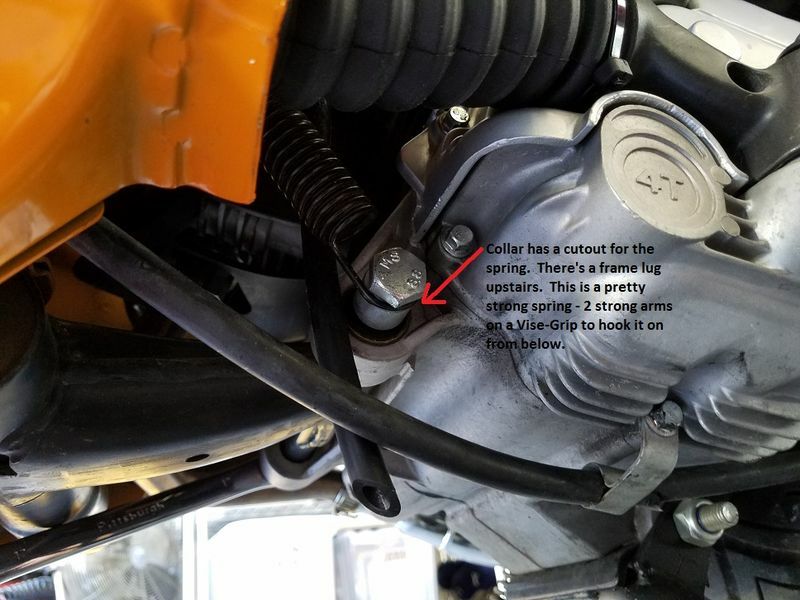 Correctly installed spacer with spring. Limited test time - gotta work SOMEtime to pay for toys - led to a realization that the white Malossi spring is pretty stiff. 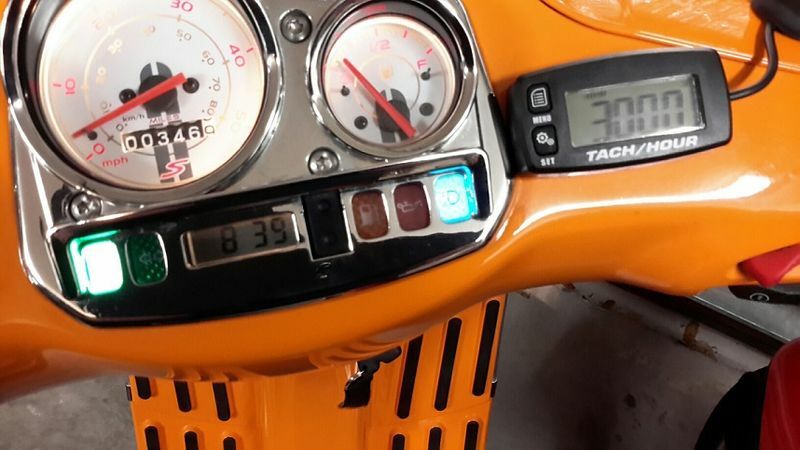 With a 34.5 gram load, pinning the throttle caused a reading of 9300 on the tach, which I suspected was north of the 4-valve 78cc engine's PowerBand even with the Malossi cam. Plus it sounded like it might be triggering the Rev limiter. Popped the belt cover off again and loaded just received "6.5 gram" rollers which actually weighed 39.5 on my Harbor Freight scale. 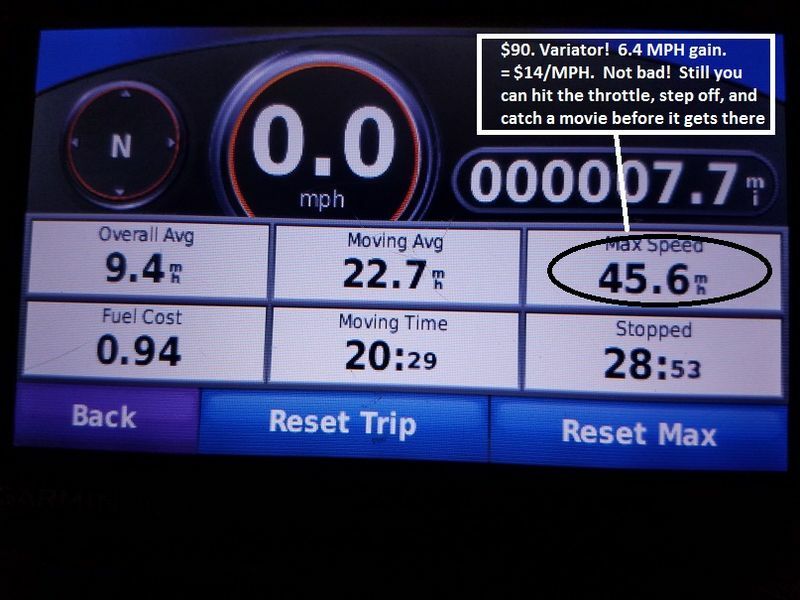 Now trouser-seat dyno indicates better thrust, no rev-limiter miss, and a more rational 8300 tach reading. Not sure if I overshot but it sure feels lively. It runs up to 55 indicated pretty darn quick set up as it is. I have the PDF Service Manual, but does anyone know offhand what the limiter setting is on the 4-valve? This is so awesome! I'm definitely paying attention to this thread to see if I can pick anything up from it. 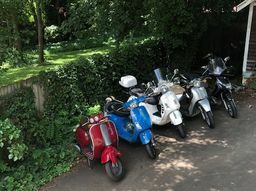 Be sure to take a look at mine, in the Scooter Gallery, and there may be some details for you there. I changed my Main jet out yesterday and it is flying right now! Fifty Schmifty: Big Bore It! I saw 3 of your threads when I looked you up under the Members tab, and you do nice work. 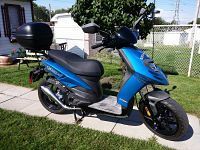 I figure it now runs about like a Honda Elite 110, but not sure I can extract much more performance from it. If you have the same kit, which jet did you install? I went with 82 main for break-in, and I'm not sure it isn't a tad rich and thus not giving me all it can. I think I got a 78 in my Jet Set, but I'd prefer to transition to an 80 which I don't believe I have. Malossi Engine Control Unit arrived today. 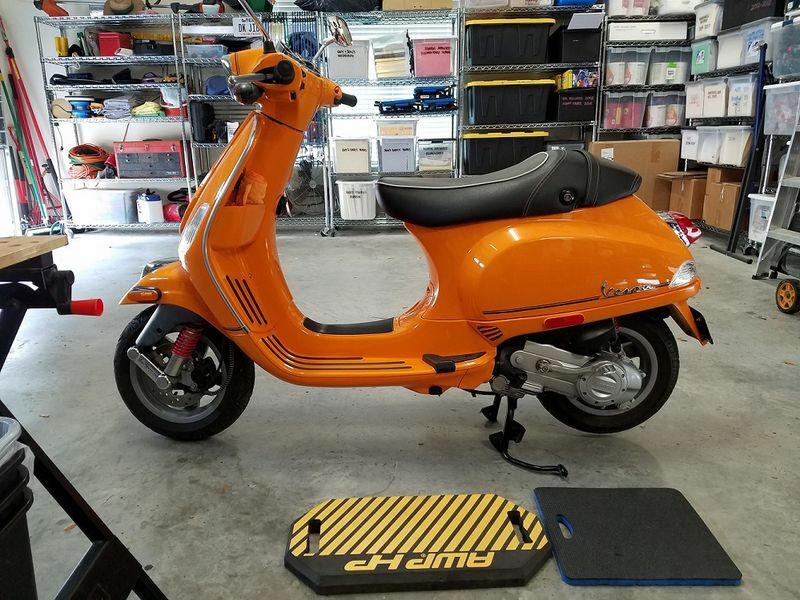 Idiot Queston: Where is the ECM located physically on the scooter? I thought I saw something like it hanging off the frame under the right side cover, but not sure if that's it or not. Also how to get to it? 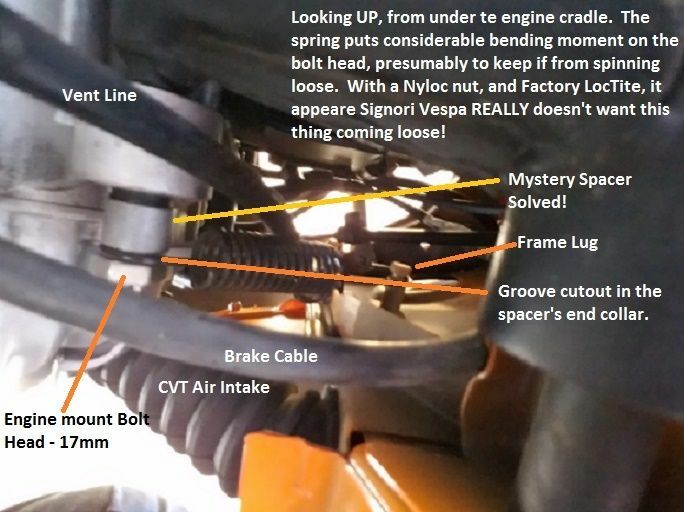 I needed a trained Spider Monkey to get the spark plug out, and it appears the quarters are tight on this thing for a lot of routine maintenance parts...I have the Factory Service Manual, but Signori Vespa doesn't seem to diagram his parts all that well. Thanks, MB, but can you tell me what cover(s) to remove to find the ECM? can you tell me what cover(s) to remove to find the ECM? On the 150 it's behind the legshield, 50 should be the same. See page 72 in the parts book. The main jet I had installed concurrently with the big-bore and cam installation was the 80 after all. It felt a bit rich, and the spark plug - with only 60 miles - supported that impression. In went the 78. The Malossi folks recommended their highly-overthunk control module for "Optimized functionality". Meh, for $140, what've I got to lose? Eventually remembered where I'd seen the stocker, well-shielded from the elements interred behind the leg shield. 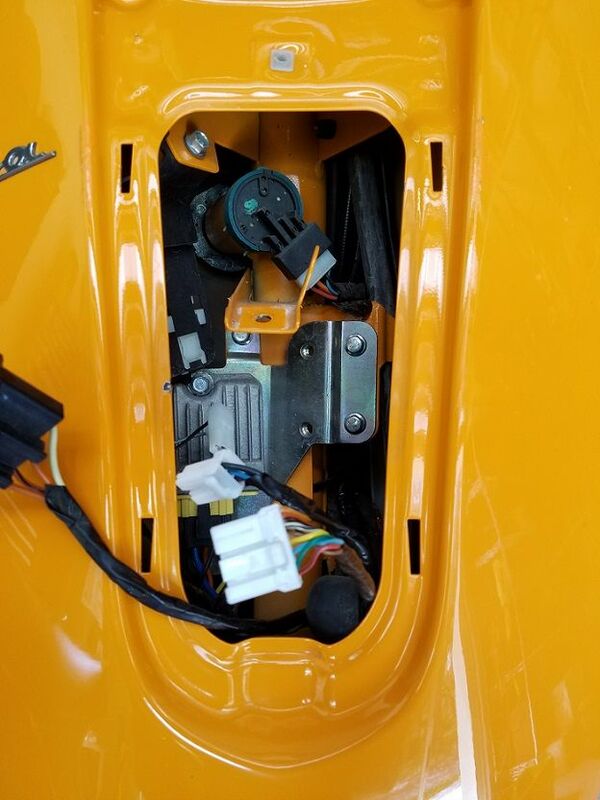 If you go here, go ahead and unclip the fuse holder and the 8mm bolt that mounts the horn to access the two bolts holding the ECM to the bracket. There's enough wire to externalize the unit in order to get at the two connector plugs beneath the rubber cap. The Malossi unit, true to form, fits perfectly and appeared to be potted very well. As for performance, a short hike down the street and back failed to demonstrate any tangible gain. Perhaps after proper higher-speed testing the conclusion will be different. 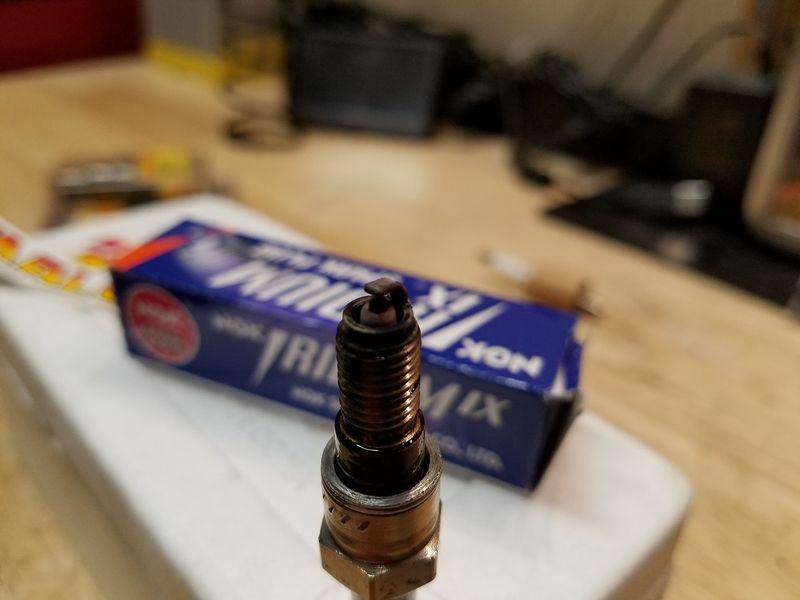 Tiny 4-valve spark plug with the detritus of about 60 miles running on an 80 Main Jet. 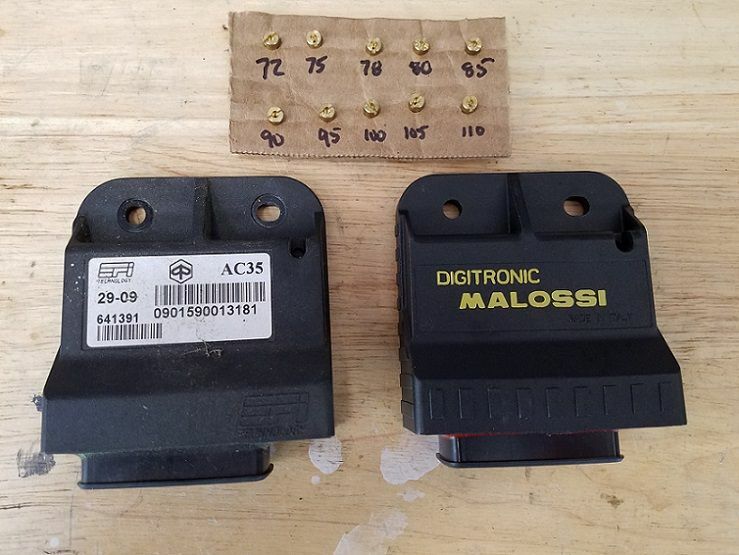 The Stock versus the Malossi Digitronic (WOW!!) modules. Malossi tucked in where it goes. Not much wind in Deepinnaharta this afternoon. Truth be told, I do most of my Braggin' Rights runs for top speed DOWNwind. Perhaps the same thought has occurred to many others? Still, with about a half-mile run-up with a quartering tailwind, Garmin-Girl said 53.6. Brightly Optimistic Vespa Speedometer needle was nudging the S, or close to 60, but of course most vehicle speedometers look decidedly on the Bright Side. With only the Malossi Variator and belt installed - No cam, no Big-bore, stock jet was 72 IIRC. Big-Bore, Cam, 78 Main Jet, Malossi ECM. 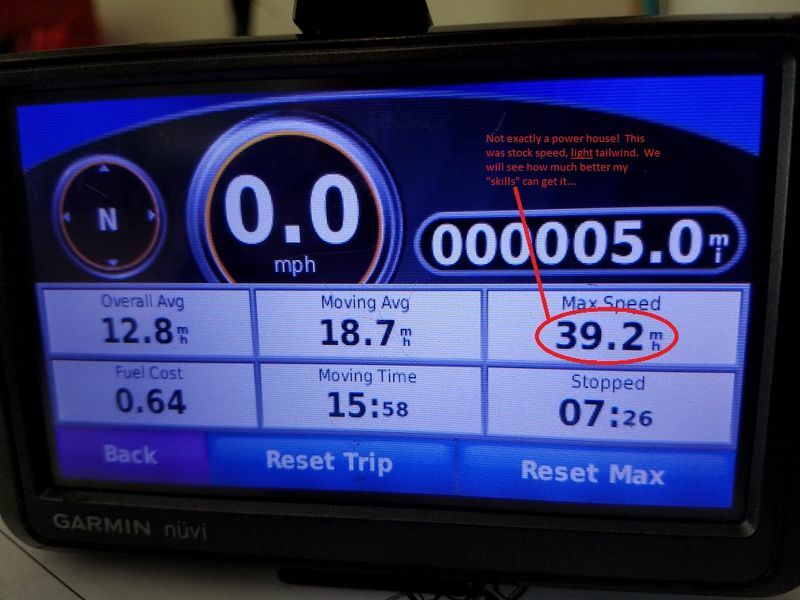 5MPH quartering tailwind, no fairing or flyscreen. Truth be told, I do most of my Braggin' Rights runs for top speed DOWNwind. Perhaps the same thought has occurred to many others? I'm not sure if you found a CHT gauge yet but Trailtech http://www.trailtech.net/digital-gauges/tto/surface-mount/temperature?p=1 makes a great one. I've used the cheap Chinese ones and these are great. They come with a short cable better suited for a Motorcycle, be sure to order the longer extension. Yes I have a TrailTech Vapor multi-gauge installed on Flash9, and it's a Must to tune the modified big-bore 2-stroke. My issue is with installation of the sensor ring on the S-50. Even my trained long-fingered Spider Monkey can't make the reach into the ridiculously-tight spark plug cavity without pulling the engine from the frame. If i ever have occasion to drop the motor, i will probably order another Vapour. For now i rely on slightly-rich jetting and a generously-sized cooling fan. Punkin still runs very well, not quite as quick as the Polini 72cc Honda, but almost. The S50 was a traffic cone in stock form, with a max speed of 39. Now running 55 or better, it's still orange, but no longer a traffic hazard in the 45MPH streets of Deepinnaharta. I have the same engine configuration on my Piaggio Typhoon 2013, except I dind't have the power cam. 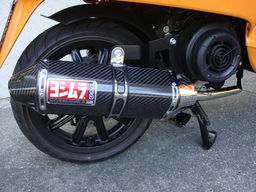 I would like to know if you have backfire with your exhaust Tecnigas GP4 ??? And what is your carburetor configuration (Jetting)? Since I installed the exhaust Tecnigas GP4 on my Piaggio, in deceleration i always have backfires. No loss of exhaust, my Pilot jet # 35 and Main jet # 78. Do you still have the tecnigas pipe on it? Have you tried to remove the DB-killer as shown in the picture below? Love your bike. Great mods. But i didn't undersatand, when i put the pilot jet #35 it make backfire on deceleration, i try #33 Much less backfire and mixture screw 2½ open!!!!??? If I go down too much I'm afraid of being too LEAN the original jet pilot of the Piaggio Typhoon is # 35! With disassembly and re-assembly, is there a possibility of a vacuum leak somewhere in the intake stream? I kept my dB "killer" in place and have no backfire issues. 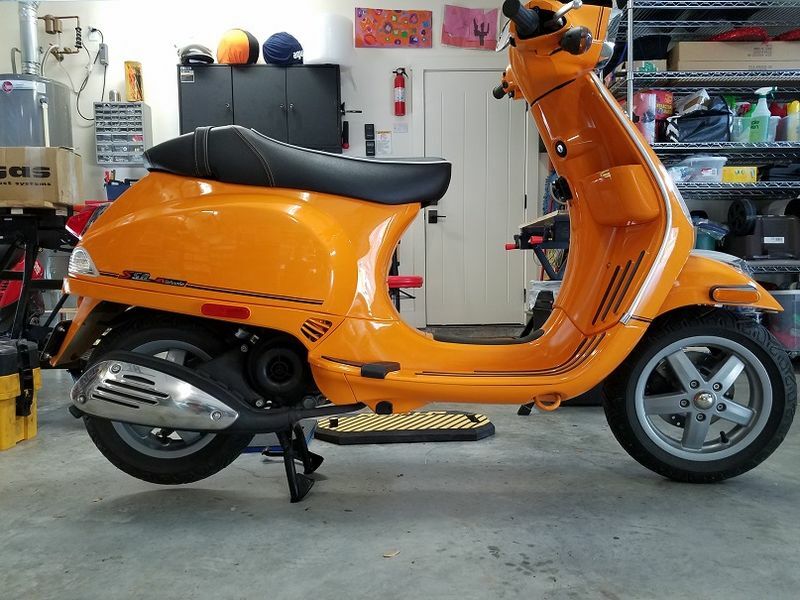 Stock Vespa Pilot and back to 78 Main. How does the pipe hold up over time? Is it still looking good and did it get any louder? 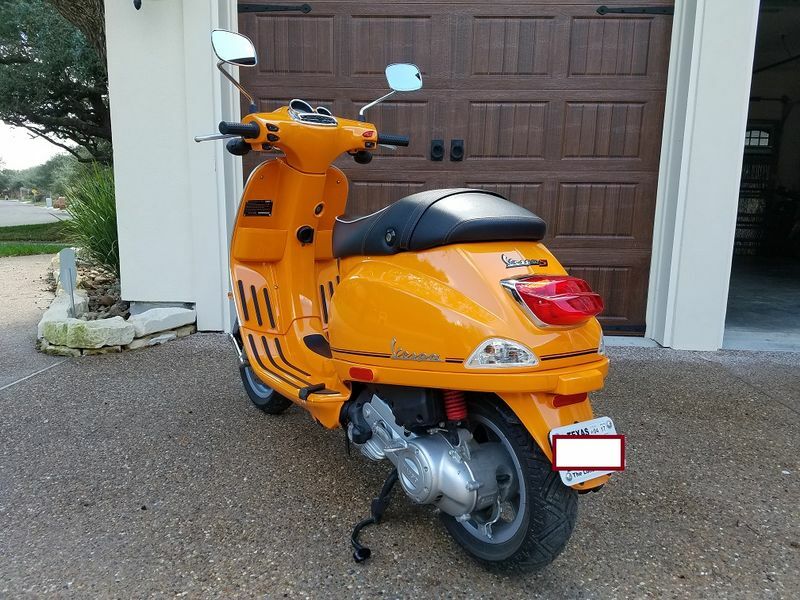 After Hurricane Harvey here in Deepinnaharta, the scooter was used for errands - driven over roads covered in moist brackish leaf debris. I couldn't keep its customary cleaning routine. Within a week or so, the body of the muffler was speckled with surface rust. Evidently there's no protective coating on the metal. It cleaned up with polish and a little Scotchbrite persuasion, but if there was a finish on there it was probably removed in the process. This may necessitate a little maintenance. 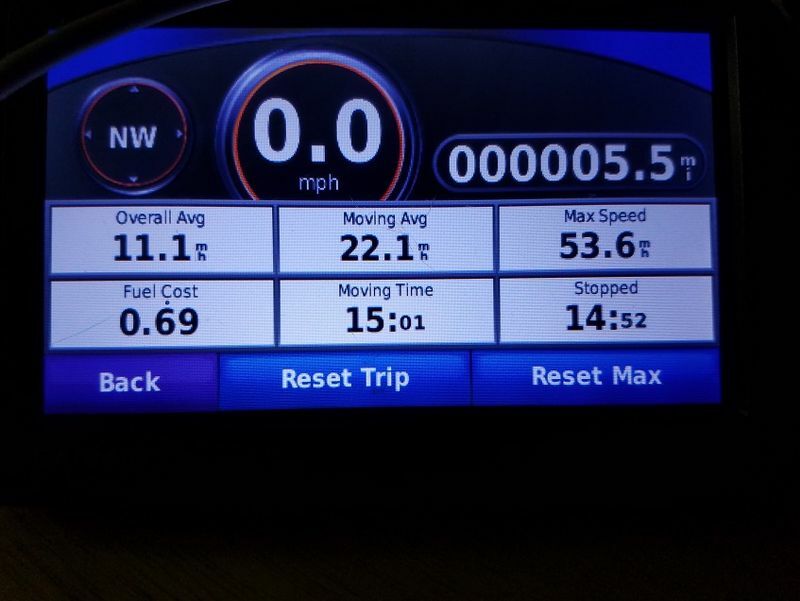 Sound levels are unchanged after about 6 months and 350 miles. Okay thanks for the feedback. My bike is putting on miles a bit quicker so I was interested to see how the pipe performs in the long term. I think I'll stick with the stock pipe for the time being. The tecnigas gp4, once the carburetor is properly adjusted, is no more noisy than the original. 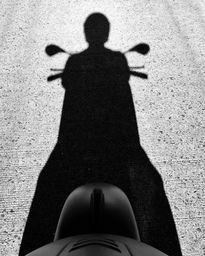 On my Typhoon 80cc, the acceleration is faster than the original exhaust and seems better kept its speed against the wind! I did not have the opportunity to ride in the rain, but as WHEELMAN says the GP4 seems to want to do spots if it is not wiped after a wash! I may have thought the painted matte black color with paint for exhaust !? Technigas exhaust modification how-to posted elsewhere. Anyone know offhand where to shop for the correct Keihin Pilot Jet assortment?